Are you one of the millions of people that will be traveling on Thanksgiving? This year will be a little more traveling for us then usual. We are going to spend the weekend in the city for a quick little get away! I hate packing for a long weekend. Actually I hate packing at all! I always over pack, or want to wear something else that I didn't bring and always, always forget something! I decided I'm gonna make a list.. and check it twice this year to not forget anything!! 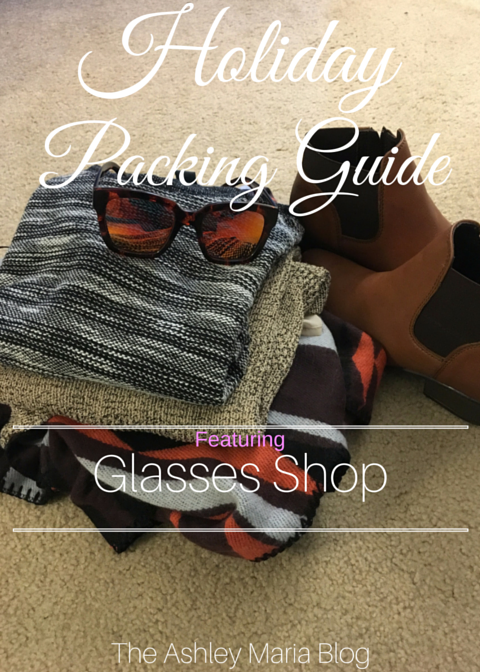 This list includes a great pair of sunglasses from GlassesShop because there is nothing I hate more then traveling without my sunglasses! Best part about GlassesShop is they offer prescription eyeglasses, cheap glasses and sunglasses for all your needs! Now back to my list.. Somehow I just know more then what is listed with appear in my bag! Oh the struggles..
Now.. if you are like me, you will likely have more then outfit to decide on for each day, but at least I am able to break them up and mix and match instead of just throwing in 10 different tops! If you want to check out these sunglasses above, GlassesShop is offering all my readers 50% off!!! Use Code: GSHOT50 for 50% off on eyeglasses and sunglasses with free lenses(sale frames excluded). These glasses are so fun to wear and look great and trendy paired with any outfit! I can see a lot of 'selfies' being seen with these on! These would make the perfect Christmas gift for friends and family! So why not get started shopping today!! This post was sponsored by GlassesShop and I have been compensated, however all opinions about the product are my own!